Following on from Mental Health Awareness week, now is a good time to consider how one charity – Mind – has successfully raised its profile recently. The issue of mental health has featured prominently in the news agenda over recent weeks. The charity Heads Together was the official charity partner of the London Marathon, and was supported by Prince Harry among others. Mental Health Awareness week provided another opportunity for charities such as Mind to publicise the work it does, as well as promoting its key messages on the subject. Indeed, after a short video was released of Prince Harry opening up about the death of his mother, Mind had a 38% increase in calls to their information line, suggesting that the Heads Together campaign had a dramatic effect on encouraging people to reach out for support. YouGov CharityIndex data reveals more good news for Mind. Over the last month Mind’s overall Attention score, (whether or not you have heard something about the charity), rose significantly, from four to nine throughout the second part of April. This has had a positive impact on overall perception of the charity. Its Index score (an overall measure of charity health) has also grown by five points in the last three weeks. What’s more, among those that would consider donating to Mind, its Impression score has risen by 13 points (from 72 to 85). The charity tracking data indicates the different groups the charity has had success with. 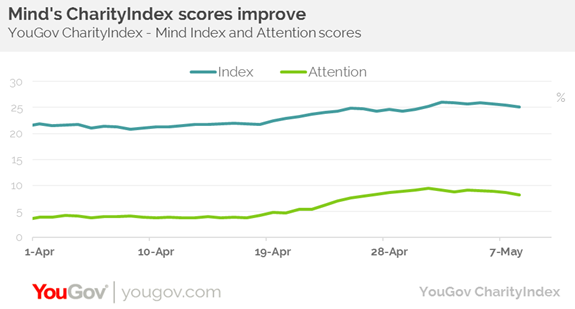 Mind has achieved particular cut through with those aged 35-49, with its Buzz score (whether you have heard something about the charity) increasing from 2 to 12 points in the last two weeks of April. There has been a particular focus on men’s mental health, and a focus on helping them to become more open about their issues. Our data shows that Mind’s Buzz score rose from one to eight among men during the same two weeks. Mind can therefore be content that it has positioned itself well while the issue of mental health has been in the news. It will be hoping to maintain the level of awareness and engagement in the months ahead.